An ongoing, multi-year study of climate change effects on redwoods in old-growth forests has yielded results some layfolks might find surprising. Among them: Coast redwoods and giant sequoias are busting out with the big girth. "Coast redwoods in a few Northern California old-growth forests produced more wood since the 1970s than ever before in their millennial lifespans," says a news release from Save the Redwoods League, which is leading the study. The study, Redwoods and Climate Change Initiative (RCCI), began in 2009 and is expected to continue at least another 10 years. Many bigshot researchers are taking part, including Humboldt State University's redwood guru Stephen Sillett. The aim is to be able to predict "how rapid global climate change will affect redwoods in old-growth forests over time." "Redwood height growth slows with age, but redwood volume growth increases, meaning older redwoods produce more wood every year than younger redwoods." "Researchers predict the northern part of the coast redwood range is likely to be the place where the fewest climate changes occur in the redwood region over the next century and may be the best refuge for coast redwoods and the plants and animals that depend on these giants." Scientists also developed a new tree ring record from ancient redwoods throughout California to support the study of how redwoods have been affected by severe droughts, fires and flooding in the past centuries. The study, called the Redwoods and Climate Change Initiative (RCCI), is a collaborative research program that began in 2009. It is led by Save the Redwoods League and top scientific researchers from UC Berkeley, Humboldt State University, the Marine Conservation Institute and other organizations to study past, present and future impacts of climate change on coast redwoods and giant sequoia forests. Save the Redwoods League is the only nonprofit organization dedicated to protecting ancient redwood forests throughout their natural range. Save the Redwoods League announced the first round of study results on August 14, 2013, during a day-long symposium at The David Brower Center in Berkeley by the top researchers involved in the study. These included Stephen Sillett, Allyson Carroll and Robert Van Pelt from Humboldt State University; Todd Dawson and Anthony Ambrose from UC Berkeley; and Healy Hamilton from the Marine Conservation Institute and Sound Science, LLC. “Although these are significant findings for redwood trees, it’s clear that we have more work to do to study how younger forests and the other redwood forest plant and animal species will respond to climate change,” added Burns. · Study how climate affects the growth and survival of redwood trees of all ages (from seedlings to ancients) throughout their ranges. · Develop an expansive tree-ring database to study how redwood trees grew over the last millennia and how climate changed. 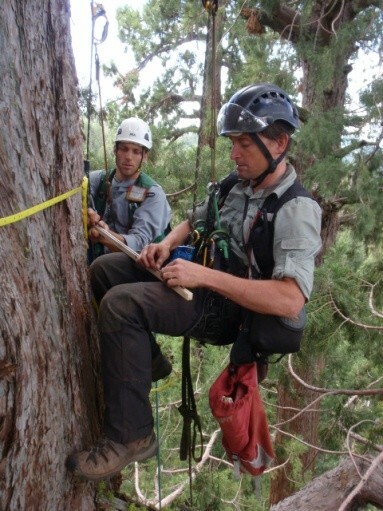 · Measure carbon storage in old-growth redwood forests. · Track changes in plants that live in old-growth redwood forests. Phase One of the Initiative was generously supported by Ken Fisher, Wells Fargo Foundation, the Bay Area Conservation Initiative of the Resources Legacy Fund, Sempervirens Fund, the San Francisco Foundation, Chapman Hanson Foundation, League members and the sponsors of 2013 Symposium, the Nancy Eccles and Homer M. Hayward Family Foundation. For more than 95 years, Save the Redwoods League has protected and restored ancient redwood forests and connected people with their peace and beauty that these wonders of the natural world will flourish. In 1850, there were nearly 2 million acres of ancient coast redwood forests in California. Today, less than 5 percent remains and faces threats from past logging, poorly planned development and global climate change. Since its founding in 1918, the League has completed the purchase of more than 189,000 acres of forestland. For more information and to receive monthly email updates, please visit www.SaveTheRedwoods.org.